Feeding your horse the correct amount of pellets or grain is not rocket science, though it does involve calculations to determine his weight. Overfeeding a horse can cause colic, bowl obstructions and can even lead to death if not corrected in time. A horse can eat as much forage or hay on a free-feeding basis, but his feed amount needs to correspond to his weight for that particular feed, as each horse food has a different weight. Determining your horse’s weight, the weight of his feed and feeding him on a set schedule keeps you from overfeeding him and maintains a healthy weight for his class. Measure your horse with an equine weight tape to determine the amount of food he should eat. Place the tip of a weight tape on the top of your horse’s withers, stretch it around his body, up the other side and back to the tape tip. This is his heart girth. Lay the tip of a weight tape on his side at his shoulder and stretch it to the rear of his buttock for his length. Multiply his heart girth times itself, multiply this product by the body length and divide by 330 to obtain his weight in pounds. For example, a horse with a heart girth of 72 and a length of 74 weighs (72 x 72 x 74) / 330 = 1,162 pounds. Read the feeding instructions on a bag of horse feed. Choose the correct class for your horse. A horse who is mature and not a working horse should be fed at the maintenance level to maintain his healthy weight. Light working horses are worked one to three hours a day, medium working horses receive three to five hours of work per day and intense working horses are exercised more than five hours a day. 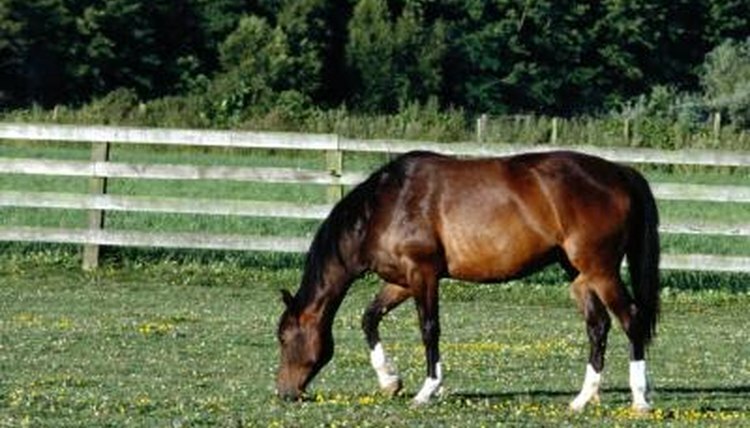 Choose the stage in a broodmare's gestation on the feeding instructions. This may include non-bred, gestation in the last three months or lactation if she is feeding a foal. Feed your horse the amount of food on the chart where his class and weight intersect. Fill a feed scoop with horse feed. Place the scoop on a kitchen scale and weigh it. Mark the scoop with a permanent marker at the top with the weight of a full scoop. Divide the weight in half and mark the scoop at the halfway area with the weight of the horse food. Mark the weight of the food at the one-quarter and three-quarter scoop areas on the scoop with a marker. Write the name of the feed on the scoop. Divide the recommended amount of feed in two to feed your horse two equal meals per day. Horses digest food much better if they are fed two smaller meals per day, rather than one large one. Measure the feed at the correct rate for two meals per day and feed your horse one meal in the morning and one in the evening, preferably about 12 hours apart.  If you acquire a new horse and his ribs are showing, slightly increase his feed to raise his weight. If you rub down a new horse’s side with slight pressure and cannot feel his ribs, slightly decrease his feeding rations to reduce his weight.  Try to feed your horse at the same time every day to keep him on a set schedule. This decreases the horse’s stress, which can result in colic.  Leave a marked scoop in the feed bin or bag. If you mix feeds, use a separate marked scoop for each bag. ⚠ Change horse foods from one to another gradually by replacing 25 percent of the old with the new food every two days over a course of about a week to decrease stomach ailments. ⚠ Put one person in charge of feeding your horse both meals so he isn’t fed twice. If more than one person feeds him, make a chart and check it off when he is fed.